In Drum & Dance, choreographer Thomas Hauert and drummer Michel Debrulle attempt to rediscover the initial tension between two beings sharing an instantaneous process of creation. The two men also play on the relationship of closeness and distance between them and with the audience. 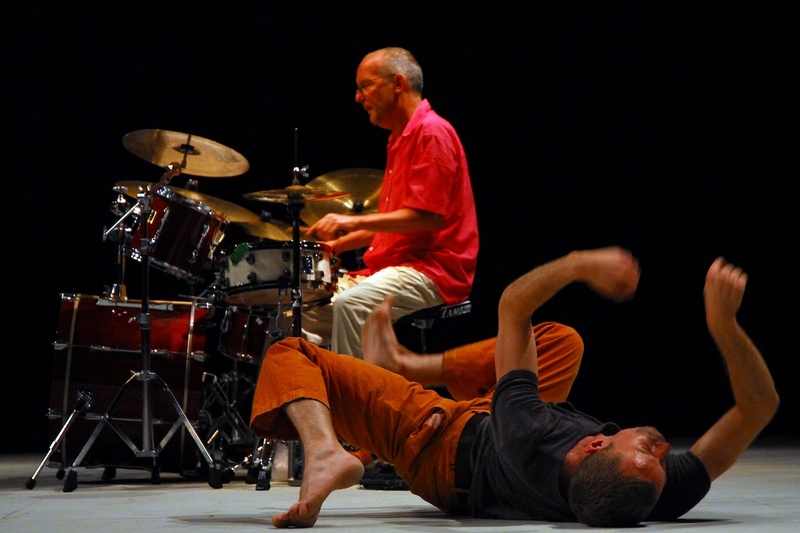 In Drum & Dance, dancer/choreographer Thomas Hauert and drummer Michel Debrulle improvise freely. Together they attempt to rediscover this initial tension between two beings sharing an instantaneous process of creation. On drums and Binche bass drum, Michel Debrulle improvises by developing and transforming a succession of musical motifs, while Thomas Hauert responds intuitively, impulsively even, letting his body react to the rhythms of the music. The resulting dance, with its exuberant energy, is informed by the distinctive characteristics of a percussion music endlessly repeating and transforming its rhythmical loops. The two men also play on the relationship of closeness and distance between them and with the audience: while the piece has on occasion been performed in theatres, it was initially created for a non-theatrical, informal space where it is the audience that defines the fluid boundaries of the stage space: without the distance of a “fourth wall”, the spectator is invited to experience the music and dance in a direct and instinctive way. Since premiering at the Beursschouwburg, Drum & Dance has been performed in very different spaces, from the promenade of the royal gallery in Ostend to a square in Bologna, the Santarcangelo festival and Florence’s Virgilio Sieni theatre.